Since the Metropolitan Opera published its ’15-‘16 calendar, Thursday night’s Tosca lost its conductor, tenor and baritone. Who could ever have imagined that the one principal who did show up would be the often elusive Romanian soprano Angela Gheorghiu? Her idiosyncratically alluring, sometimes maddening, always fascinating Floria Tosca inevitably became the evening’s unmissable raison d’être! 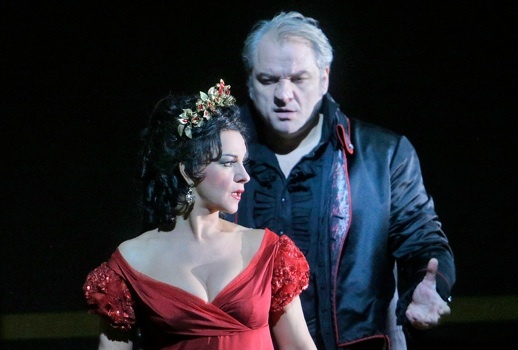 Once one of the Met’s biggest stars, Gheorghiu, who recently turned 50, had been absent from its roster for nearly five years when she returned last season for just two performances of La Bohème opposite Michael Fabiano. While those reappearances were mostly well-received, Mimi has been a frequent Met role for her there since her debut in Bohème 22 years ago. 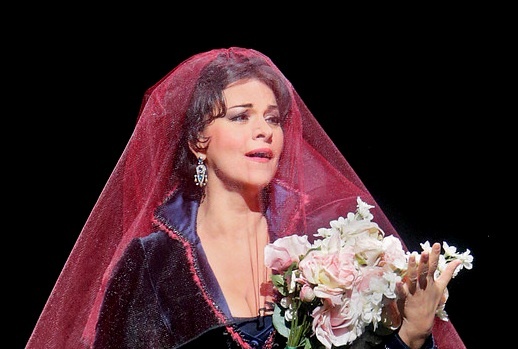 However, the prospect of a Gheorghiu Met Tosca, a portrayal until now seen only in London, Vienna and San Francisco, was a much more enticing prospect for the sizable contingent of diva-watchers who assembled last night curious to discover how the frequently capricious soprano might tackle this most coveted and demanding title role. Although she had starred in Benoît Jacquot’s effective 2001 film of Puccini’s masterpiece opposite her now ex-husband Roberto Alagna, many doubted she would actually take on the role onstage. Yet five years later she starred in a new production by Jonathan Kent at Covent Garden, captured on DVD at a starry revival there in 2011 conducted by Antonio Pappano with Jonas Kaufmann and Bryn Terfel. Thursday’s Met Tosca was an altogether bumpier, less glamourous affair. Substituting on the podium for the ailing Placido Domingo, who recently had gall bladder surgery, Paolo Carignani led an often raucous, unsubtle reading that didn’t sound like he was taking any special pains to accommodate his new star. Originally only scheduled to take on Mario Cavaradossi for the final three performances with Liudmyla Monastyrska, Roberto Aronica instead jumped in early for the ailing Massimo Giordano. Returning to the Met for the first time since 2008, the handsome Italian tenor generally wielded his big burly instrument like a blunt object. While “Recondita armonia” seemed distracted and brusque, the “Vittoria” sequence in the following act sounded huge, its high notes thrilling. His softly introspective “E lucevan le stelle” began promisingly, but he then leapt to his feet and belted out the final phrases as if trying to reach the back rows at the Arena in Verona! I suspect many squillo-queens were in heaven with this loudly unpoetic Mario, but most of us were left wanting more. Simon Keenlyside’s cancellation of all of his Rigolettos along with Dmitri Hvorostovsky’s partial withdrawal from Il Trovatore caused baritone chaos at the Met this fall. The originally scheduled Scarpia, George Gagnidze, took over Rigoletto, so Zeljko Lucic, having just finished his run as Iago in the new Otello, arrived early. Lacking the ideal snarling force—his “Te Deum” was particularly underpowered—Lucic gave us a Scarpia who was more the ravenous sensualist than the brutal predator. His warmly enveloping baritone and self-amused demeanor suggested that under other circumstances he might have been a real rival to Cavaradossi. A delicately moving Violetta, like her compatriots Virginia Zeani and Ileana Cotrubas, Gheorghiu might not have seemed a natural match for Tosca. But Thursday she made the role her own: a feminine, vulnerable woman, not the shrewish virago one often sees. From the beginning, Gheorghiu had the audience on her side, something not every Tosca can manage. Needless to say, she looked ravishing, first in a sleek black gown with red piping and red veil, then in a striking and immensely flattering crimson creation topped with a new and regal tiara. Richard Peduzzi’s bizarrely stark Castel Sant’Angelo set for the third act saw her swoop in, an avenging angel clad all in black with her lustrously glossy hair now tumbling around her shoulders. This Floria was truly, deeply in love with Mario, ecstatically rapt as he sang the praises of her dark eyes. Initially, her jealousy at the discovery of the Attavanti portrait was playful and coquettish. Crushed at Scarpia’s revelation of the fan, she was unable to comprehend that her lover might have betrayed her. Alone in Scarpia’s lair, Gheorghiu’s frightened, trapped prima donna resorted to murder only when she felt she had no other choice. Her shocked and uncomprehending reaction to her brutal act was extremely powerful. The playful lover returned to comfort Cavaradossi in the final act, blindly secure that she had succeeded in assuring their future together, blithely ignoring Mario’s urgent doubts. Her girlish delight at his play-acting gave way to fathomless despair when she discovered Scarpia’s scheme. 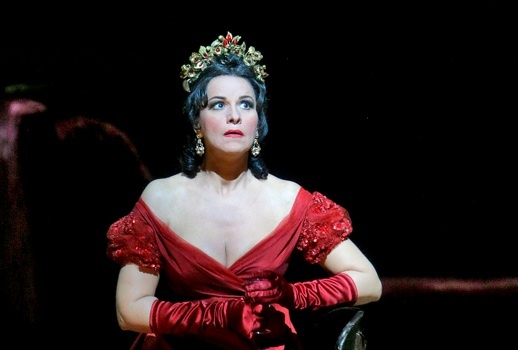 If less heroically flamboyant than some, Tosca’s suicide has never seemed more inevitable, yet so sad. 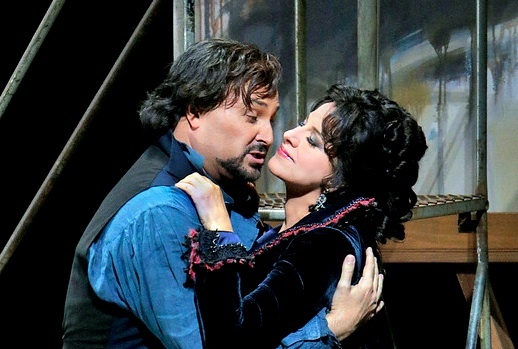 Most surprising about Gheorghiu’s performance was its avoidance of the usual “diva” theatrics. For all her reputation off-stage as a demanding, sometimes difficult prima donna, her Tosca remained refreshingly down-to-earth and sympathetic although she still kicked her train with a stylish flair to match the best of her predecessors. Vocally, matters were altogether rockier; those who prefer their Puccini opulent and stentorian would have been very disappointed. Gheorghiu’s voice has always had a touching fragility that made it a perfect vehicle for the composer’s Mimi, Liù and Magda. In addition, with age, the middle has dried out becoming more hollow-sounding, though her top remains remarkably shining and vibrant. To her credit, in Tosca’s dramatic and demanding music she never pushed, never screamed or sounded ugly. To all those who have complained for years about her “inaudiblity,” I would say that since my first exposure to her—as Mimi the night of Alagna’s Met debut in 1996—I have never had a problem hearing her. Yes, there have certainly been moments where one wanted more voice than one got; her 2011 Adriana at Carnegie Hall in particular was often frustratingly under-sung. One occasionally felt on Thursday that she was in over her head when she was buried under Puccini’s dense orchestration, but those moments were relatively few. Her “baby chest” voice sometimes failed to deliver the expected frisson, but her vibrant upper voice blazed. One always expects “Vissi d’arte” to be a high point of any Tosca, but hers was genuinely special, a simple, hushed prayer delivered with exquisite shading and remarkable control. Her falling to one knee at the climax seemed both utterly in character and the perfect “diva” moment to solicit the riotous ovation that ensued. A lack of rehearsal seemed evident in a number of musical mistakes and miscalculations. However, the improvisational nature of the performance may have also contributed to a palpable dramatic spontaneity that made her confrontation with Scarpia particularly exciting. More often than not, she eschewed Luc Bondy’s much-reviled staging and the ever-game Lucic was right there with her. Her complete restaging of the final moments of the second act were the most effective I have seen in this production, much of which otherwise remains as ugly and awkward as it has since its premiere in 2009. While those weaned on Zinka Milanov or Renata Tebaldi (to say nothing of Maria Callas) would likely denounce Gheorghiu as a girl struggling to do a woman’s job, I was happy to have experienced her smaller-scaled, yet remarkably fresh and touching Tosca. Sadly just one opportunity remains to experience it next Monday before her polar opposite—Maria Guleghina—returns to the Met to offer up yet again her Roman diva. Photos by Ken Howard/Metropolitan Opera.